One of the best things about Italian cities and towns is that there is always a (really) high spot somewhere in them allowing you to appreciate their beauty from a bird’s-eye view. It could be a hill or a clock-tower, a cathedral’s dome, a terrace on top of a building or a leaning turret. Scaling it may leave you a bit out of breath and very light-headed at the thought of the great height you finally find yourself at. Yet, it will be totally worth it. For your eyes will feast on some gorgeous views and then some. This was the case for me, when we ventured up to Piazzale Castel San Pietro in Verona a couple of months ago. It was a beautiful blue sky day with just the right amount of fluffy white clouds to make it all so picture perfect. The river Adige rushed fast underneath centuries-old and contemporary bridges. And with its red rooftops, square bell towers and lush vegetation the city of Romeo and Juliet gave a very convincing presentation as to why Shakespeare chose it as the setting of the world’s most famous love story. So, I had to snap a photo. Actually, I snapped quite a few, but this one was the best of them all, so I am sharing it with you. If you find yourself in Verona, make sure that you make your way up to Piazzale Castel San Pietro (it’s less than a 30 mins walk from Arena di Verona and just above the Roman Theatre). The best bit is that a newly opened funicular will take you in just over a minute up to the top of the 37 meters steep inclination where the gorgeous view awaits you. So, you won’t have to huff and puff up the hill, curse all the good Italian food and gelato you have stuffed yourself with and solemnly promise to finally make good on your promise to join the gym after all. By the way, I made a video of riding the funicular on the way down and will post it on my Facebook page as soon as I am done downloading Adobe Premier Pro, so keep an eye out for it. 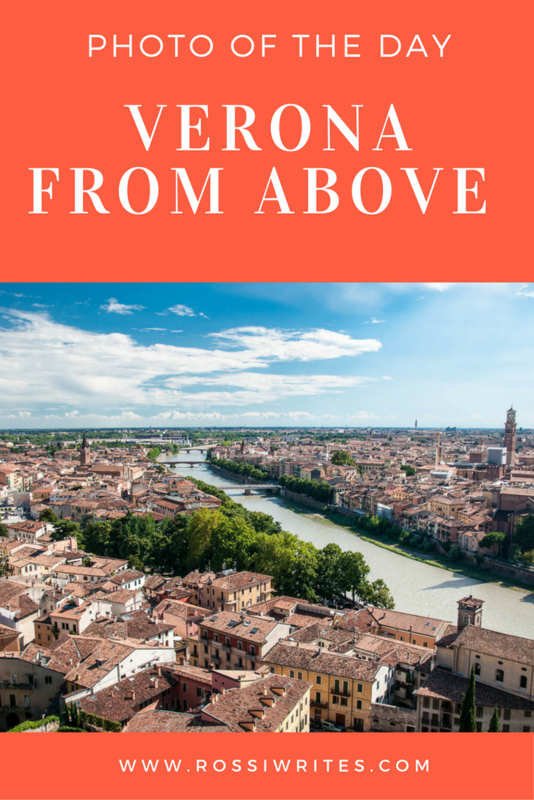 Have you been to Piazzale Castel San Pietro in Verona? How did you find the view? Let me know.